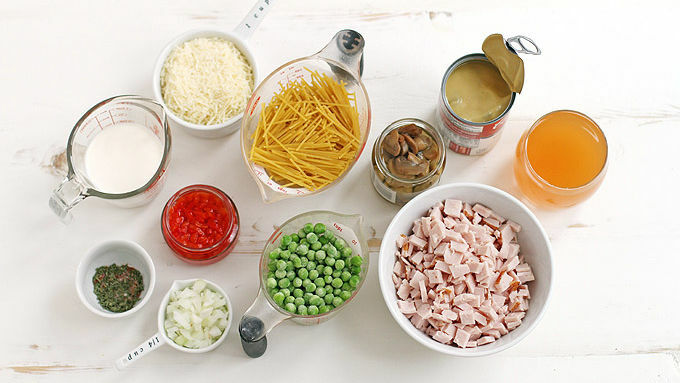 Begin by gathering your ingredients, and then lightly spray bottom and sides of a slow cooker with cooking spray. In a large bowl, stir together soup, broth, cream and wine. 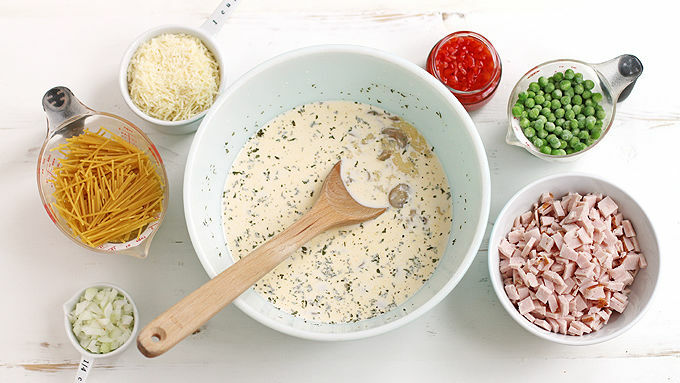 Add turkey, noodles, peas, 1/2 cup Parmesan cheese, onion, pimientos, mushrooms, dried parsley, paprika, salt, pepper and nutmeg. Stir until just combined. Pour mixture into prepared slow cooker. Sprinkle top with remaining Parmesan cheese. Cover and cook on LOW 4 to 5 hours until noodles are tender. Serve topped with chopped fresh parsley and more salt and pepper to taste. Don’t have any leftover turkey? Swap diced cooked chicken breast or rotisserie chicken. 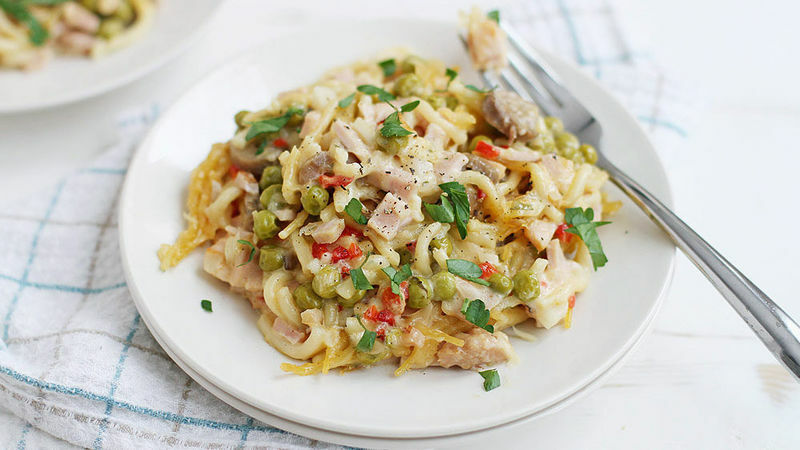 Tetrazzini sounds gourmet, but it's really the easiest thing ever to make with your turkey leftovers. How can something so easy be so filling and delicious? If there’s one thing I like to do the day after Thanksgiving, it’s nothing. You heard me – after a day of working hard in the kitchen, chatting/laughing/”friendly debating” with family and marathon eating, the only thing I really have energy for the next day is putting my La-Z-Boy to good use (Okay, I don’t actually have a La-Z-Boy, but you catch my drift). And eating. I can definitely still find room to eat the next day. 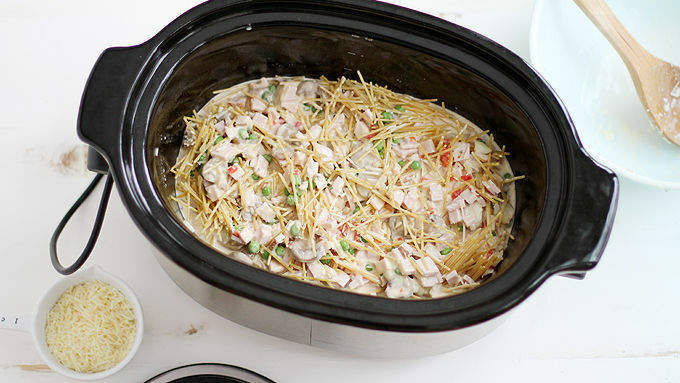 That’s why this slow cooker turkey tetrazzini is my new best friend. 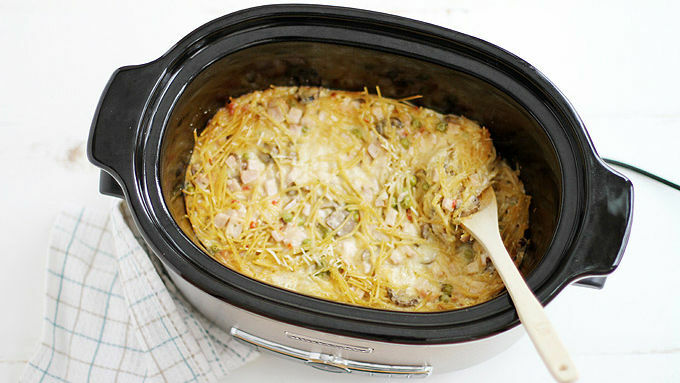 Combine leftover turkey, noodles, soup, veggies, cheese and spices in a slow cooker, turn it on and let it be. In about four hours, you’ve got yourself a comfort food meal you can cozy up with in that recliner of yours. Let’s get to it (so we can get back to being lazy)!